Ulauncher runs all extensions from ~/.cache/ulauncher_cache/extensions/. api_version - version of Ulauncher API. Currently only version “1” is supported. preferences - list of preferences available for users to override. They are rendered in Ulauncher preferences in the same order they are listed in manifest. All fields except options are required and cannot be empty. Default 0.05. Delay in seconds between event is created and sent to your extension. If a new event is created during that period, previous one is skipped. Debounce helps to prevent redundant events caused by user typing too fast or maybe some other reasons when you may not want to process events each time they are triggered. If your extension is super responsive (i.e, doesn’t wait for I/O operations like network requests, file read/writes, and doesn’t load CPU, you may want to set a lower value like 0.05 or 0.1. Otherwise it’s recommended to set value to 1 or higher. At least one preference with type “keyword” must be defined. All fields except description are required and cannot be empty. Run ulauncher -v from command line to see verbose output. When you type in “dm ” (keyword that you defined) you’ll get a list of items. This is all your extension can do now – show a list of 5 items. Create a subclass of Extension and subscribe to events in __init__(). In our case we subscribed to one event – KeywordQueryEvent. This means whenever user types in a query that starts with a keyword from manifest file, KeywordQueryEventListener.on_event() will be invoked. on_event() may return an action (see Actions). Return RenderResultListAction in order to render results. ExtensionResultItem describes a single result item. You can also use ExtensionSmallResultItem if you want to render more items. You won’t have item description with this type. 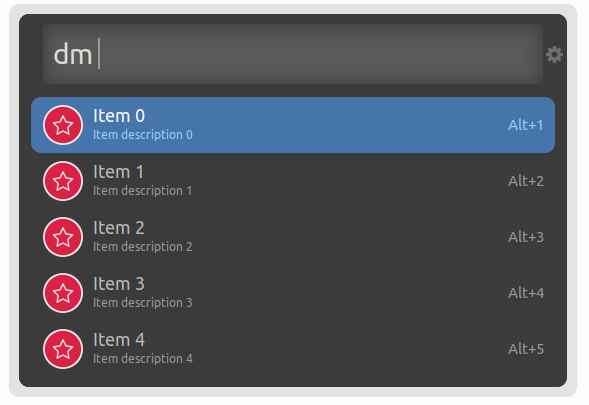 on_enter is an action that will be ran when item is entered/clicked. data is any custom data that you want to pass to your callback function.